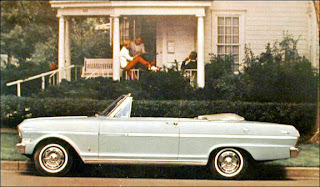 Two convertibles were available in the Chevy II family in 1963. The 300 series ragtop carried a $2,896 price tag f.o.b. Oshawa when powered by the four-cylinder engine. In the beginning, there was Corvair. It was because of the Chevrolet Corvair that there was a Chevy II. 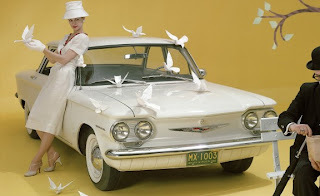 Chevrolet launched its Corvair compact with great fanfare in the fall of 1959 as a 1960 model. Featuring an air-cooled, rear-engine layout and enough interior space for six adult passengers, the Corvair was designed to compete head on with American Motors’ Rambler, not Volkswagen’s Beetle. Designers at Chevrolet were reminded regularly throughout its gestation period that it was the homegrown Rambler, not the imported Volkswagen, that was their target. 1960 Chevrolet Corvair was built in Oshawa, Ontario. Corvair should have been a huge hit for General Motors. Oshawa’s sales and marketing departments watched with growing disappointment as its unique, rear-engined entry did not set the world on fire. GM Canada had invested heavily in a new facility for the compact. Workers in Oshawa built 7,237 units of the nifty little performers during the 1963 model year run but the restyled Rambler and the second generation Ford Falcon outsold the compact Chevy II by a country kilometre and more. 1963 Rambler Classic Cross Country station wagon. The fact that Corvair didn’t sell particularly well was actually of some small relief to GM’s top brass in Detroit. 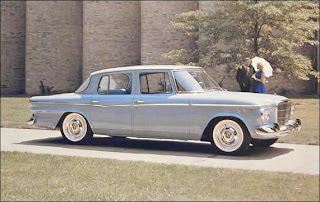 When planning began for the Corvair back in 1956, it was widely feared within management that if Chevrolet successfully entered the compact market it might cause independent automakers Rambler and Studebaker to go bankrupt. That would undoubtedly prompt Congressional hearings in Washington. The resulting anti-trust action would surely lead to the break up the General Motors. There was no need to fear. Even with the entrance of the Ford Falcon and the Valiant from Chrysler, the domestic desire for smaller cars grew stronger every day. Sales of Ramblers, Larks and West German Beetles continued to rise like the head on a good Molson Export. Since the independent automakers were more than holding their own, Chevrolet’s stylists and engineers were immediately put to work on a complimentary but more conventional “senior compact,” dubbed the Chevy II. 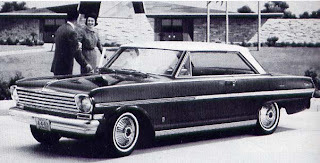 The Nova 400 SS Coupe was a hardtop, weighing in at 2,590 pounds in 1963. Chevy II production got under way at GM in Oshawa, Ontario for the domestic market. Nine models were available, three of them in the top-of-the-line Nova series. 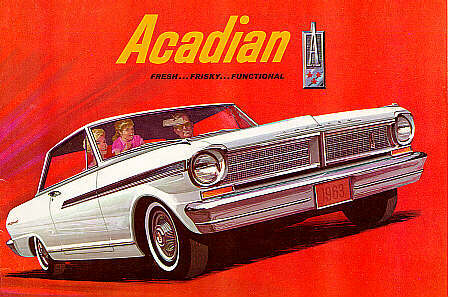 A Canada-only version of the Chevy II was badged as the Acadian brand and sold through Pontiac-Buick dealers. 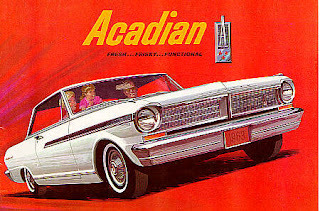 1963 Acadian was a kissin' cousin of the Chevy II. Bowing to the public for the 1962 selling season in September of 1961, the Chevy II was offered in four series: a base 100 equipped with a modest four banger and an equally stripped 200 model with a six-cylinder engine. Further up the ladder was a mid-priced 300 and finally, a very nicely appointed Nova 400. The 200 series was discontinued almost immediately after its introduction. When station wagons were counted in the mix, the model offerings swelled to a sweet sixteen in number. Two brand new engines powered the Chevy II. When equipped with the thrifty, 153-cubic inch, L-head four-cylinder mill, rated at 90 horsepower, the price tag was $2,400. With the 194-cubic inch L-head six with 120 ponies ready to pull, the price tag rose to $2,470. Three-speed manual transmission was standard equipment but a new, lighter weight Powerglide automatic transmission could be ordered, if one wished to spend the bucks. The plain Jane 1963 Chevrolet Chevy II 100 series four-door sedan cost $2,456 when equipped with the four-cylinder engine and $2,526 when the six-cylinder mill was ordered. Designed for those who sought economy while raising a young family, a compact car cost less at the time of purchase. Financing required a hefty down payment and Ottawa kept credit tight. Parliament dictated that car loans must be paid off in a relatively short period of time. 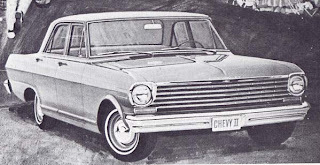 The least expensive Chevy II in 1963 was the two-door sedan in the 100 Series. 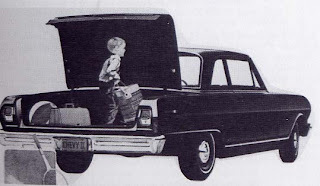 All of Chevrolet’s senior compacts rode on a 110-inch wheelbase. Aside from a smaller outlay of cash at the time of purchase and lower monthly payments, it was estimated that an owner would spend $90 a year less in gasoline and cough up substantially less for insurance premiums. Those savings added up quickly. The practical Chevy II appealed to Canadians and it quickly soared in sales. The folks at Canada Track & Traffic tested a Chevy II. Calling Chevrolet's new senior compact “an honourable compromise,” its editors were of the opinion that its styling was more European than American in its looks. Still, they passed it by and named Studebaker’s Lark as its Car of the Year for 1962. 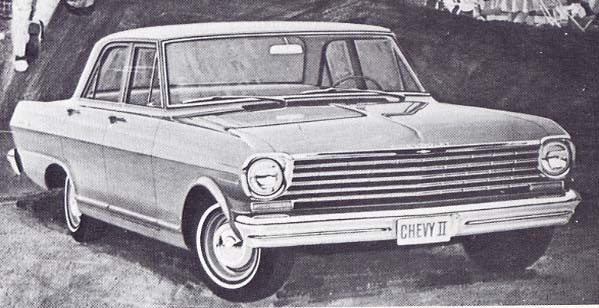 Production of the Chevy II in Oshawa added up to 15,802 units for the model year, which meant that the Chevy II captured 4 percent of the domestic market. In comparison, Ford Falcon’s total was 18,215 units beating the Chevy II and the now domestically-built Rambler’s 17,343 unit total by a whisker. GM’s cloned Acadian did nearly as well with 13,010 units produced. Virtually unchanged for 1963, the Chevy II returned to Chevrolet-Oldsmobile dealerships across the Dominion. The six-cylinder, 300 sold for a modest $2,456, snapping hard at the heels of Rambler’s Classic 660 with its list price of $2,734. There were minor trim shuffles for the baby bowtie but more importantly, Chevy II was blessed with a better suspension. Important improvements were made to the unit body construction, as well. Five of the ten Chevy II models offered in 1963 were station wagons. This is the top-of-the-line Nova 400. Consumers still wanted small cars but like last year, the phenomenon of loading compacts down with optional equipment was growing stronger. Powerglide transmission, radio, heater, bucket seats and seat belts were all popular extra-cost items. A total of 19,993 Chevy IIs were sold during the 1963 calendar year, giving the senior compact 10th spot in sales. Acadian sales added 14,707 more. Valiant was the third best selling car in the country followed by fourth-place Volkswagen and Rambler parking neatly in fifth place. More than forty years have passed since the Chevy II bowed to the public. John Diefenbaker’s Tories lost the federal election to Mike Pearson’s Grits in 1963. Jean Chretian was first elected to the House of Commons. The Bluenose II was launched. Simon Fraser University and the Universite de Moncton were established. The Littlest Hobo, starring London, a German Shepard, debuted on CTV and The Forest Rangers bowed on the CBC. A cub reporter by the name of Peter Jennings reported President John Kennedy’s assassination from Dallas for the CTV Television Network. Gone but not forgotten, there was a time when life was simple and in 1963 part of that simplicity was the Chevy II.